Representatives of Ninkasi Brewing Company eye a rocket carrying beer-making yeast before its Oct. 23, 2014 launch to space. Space fans can now toast to a beer with an out-of-this-world origin: A new brew was made from yeast that survived a trip to space. The yeast was unaffected by its brief microgravity experience, but the new beer faced some challenges on its journey to space and back. At 10:30 p.m. on the night before Ninkasi Brewing Co.'s yeast was supposed to launch into space this past October, the founder of the company faced a crisis. Ground Control is a new "space beer" from the Ninkasi Brewing Company made from yeast flown in space. "We made 30-some calls," Ninkasi founder Jamie Floyd told Space.com, but there were no other dry-ice providers open anywhere near the isolated town of Truth and Consequences. Floyd went back to the Walmart and learned there was a new store with dry ice some 180 miles (290 kilometers) south, on a route that required crossing the Mexican border. Floyd managed to deliver the dry ice only an hour late. 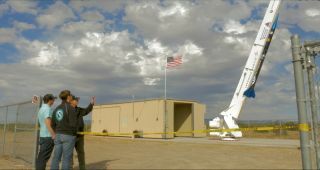 Turns out, the border guards were used to the unusual declaration because payloads for rockets launching at the nearby White Sands Missile Range use dry ice for such purposes all the time, he said. After the minor misadventure, three variants of yeast successfully launched on the so-called Mission Two on Oct. 23, 2014. The launch was carried out by private aerospace company UP Aerospace for NASA's Flight Opportunities Program. Ninkasi's contribution included six vials stored just below the rocket's nose cone. Of those vials, four survived: two with an ale yeast used as the basis for the new beer and two other vials with a southern German lager strait and an alt yeast strain. The beer that incorporates the ale yeast is an imperial stout called "Ground Control," which Ninkasi launched April 13. Ground Control is available in specialty stores where Ninkasi currently distributes, which is mainly in the western United States and Canada. Small quantities also may be shipped to Philadelphia, New York City and Washington, D.C. The yeast soared 77.3 miles (124 kilometers) high — beyond the internationally accepted boundary of space, which is 62 miles (100 km) — and the vials were weightless for about 4 minutes. The samples were retrieved within 2.5 hours and were rushed back to Ninkasi's laboratory in Eugene, Oregon. Space launches are rare for breweries, but for Ninkasi, Mission Two was the second attempt in just a few months. Floyd, a lifelong space enthusiast, said the idea came from meeting amateur rocketeers through a mutual friend. A rocket carrying yeast for Ninkasi Brewing Company launches from Nevada's Black Rock Desert in July 2014. This so-called "Mission One" did not result in any “space beer” because it took four weeks to retrieve the payload and most of the yeast cells died. The collaboration first led to an unsuccessful attempt to launch yeast on a July 2014 mission at the Black Rock Desert in Nevada, an attempt that Ninkasi dubbed Mission One. Co-led by two amateur rocket groups, the Civilian Space eXploration Team (CSXT) and Team Hybriddyne, the launch was executed well. However, it took 27 days to locate the rocket because two of the three tracking devices failed at ignition, Floyd said. Also, the rocket fell more than 2 miles (3.2 km) off course, in a region already heavily pockmarked by missile testing. By the time the yeast was retrieved, only a handful of cells were living. But this first attempt taught the company some important lessons. For instance, it was a mistake to put the yeast at the nose cone tip because that area of the rocket experiences the greatest temperature change during flight, and thus makes it more difficult to keep the yeast alive, Floyd said. The mission scientists were able to apply some of the knowledge they learned from that mission to Mission Two. Floyd said he'd love to do another launch, but joked, "We don't know how often we'll be able to do this." In the meantime, the company plans to use the other launched yeasts in yet-to-be announced beer variants.